Sheffield Steelers owner Tony Smith is hopeful that the club can retain play-off winning coach Gerad Adams. Adams took over in February after the sacking of Doug Christiansen and guided the side to a 3-2 overtime win over Belfast Giants on Sunday. "I'll talk to Gerad later this week and hopefully we can resolve that situation very, very quickly," Smith told BBC Radio Sheffield. "I'm confident we can keep him because he wants to be successful." He added: "Gerad knows what it means to be a Steeler and that in itself gives me confidence he will want to stay. "The deal will be done one way or another by Thursday but it's his decision to make." 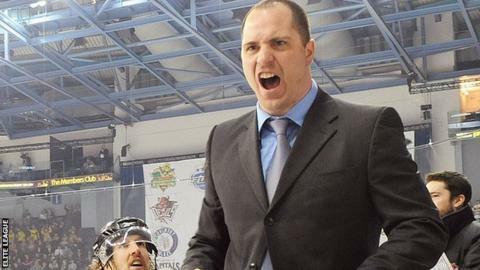 The former Steelers defenceman returned to the Sheffield side after over a decade as player and coach of Cardiff Devils. Smith praised the impact that the Canadian has had in galvanising the players. "He's allowed the guys to play with the passion and the flair that they wanted to show from day one," Smith said. "He's a man of few words but it seems that the ones he does say have a big impact on the group. "The players can't wait to get into work every morning and they respond to him because he's a charismatic guy."